It’s one thing to say you’re an author but I think this week was the first time I really felt like one. 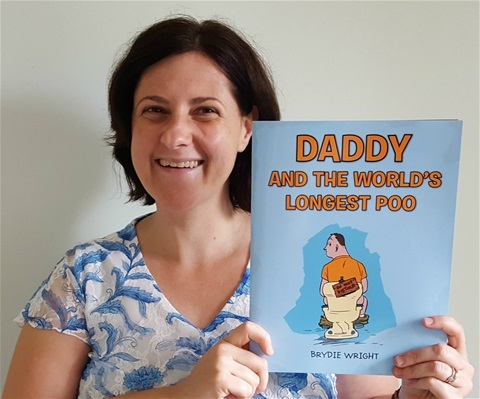 On Monday 13th February, the publicity campaign for Daddy and the World’s Longest Poo began in earnest. My press release went out on the wires in the USA and Australia, care of LAVIDGE PR. I first knew it had hit the news when I woke up on Tuesday to find that The Bookshelf Café had picked it up and tagged me into the post on Twitter. A brilliant tweet to wake up to! Being able to cross-post about my publicity campaign across social media, with the tangibility of a press release, has caught the attention of my burgeoning group of Twitter and Facebook followers. It was so much fun to feel more engaged with the kind people who support my work. Even the notoriously serious and tough crowd on LinkedIn came out of the woodwork slowly to like my post or even some brief supportive comments. The events and project manager, turned author, had finally caught the attention of some of her former colleagues. This gave me a real buzz and I’m very appreciative for this support. As a self-published author, without the industry validation (or marketing budget) of a trade publisher behind me, I felt it imperative to invest in my picture book and seek professional assistance for its promotion. I want it to have the best chance possible to find an audience. My social media posts this week have had an air of excitement about them that was lacking a little in the New Year, while I was patiently awaiting my campaign to begin. It can be hard for a new, unknown writer to have the courage of their convictions to say, "I am an author," and by a happy coincidence, I was afforded the platform to announce this during my first meeting as a member of the NSW branch of the Children’s Book Council of Australia at The Children’s Bookshop in Beecroft this week. The very welcoming President asked me to say a few words about myself and the release of my book and though nervous, shared with a group of authors that I had published my first book and had just begun my publicity campaign. It’s funny how confidence and self-belief can beget recognition. The next time I was called an author this week was in my Jazzercise class when the instructor Shirley kindly announced me as such, mid-way through a dance routine, and recommended members of the group read a glowing blog I had written about the class for WeekendNotes. Public recognition! I felt a little embarrassed but had to own the mention. Recognition for my book and my writing is what I’m aiming for, after all. There is no point being shy about it. And now, with some great social media strategy under my belt with help from LAVIDGE PR, I look forward to sharing the next stage of my little book’s journey on Tuesday! Have a great weekend.